Let's call guitarist Stu Marshall's latest Empires of Eden project, Channelling the Infinite, exactly what it is: this is a metal album. Gone are the flourishes of prog nuances. This is old school tour-de-force, guitar driven, melodic heavy and power metal by one who knows the genre well, as does his collaborating host of cohorts. 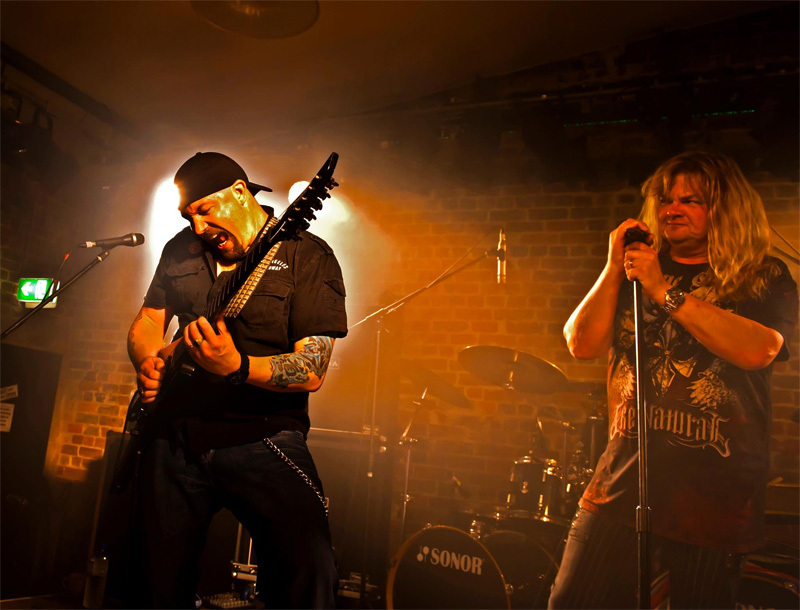 With Steve Grimmett (r), Empire of Eden's Stu Marshall: goes postal on his guitar. Once again Marshall recruits some of metal's finest vocalists to put a voice to his music. The short list includes Udo Dirkschneider (Accept, U.D.O. ), Rob Rock (Impellitteri, Driver), Steve Grimmett (Grim Reaper, Lionsheart), Mike Dimeo (Masterplan, Riot), Sean Peck (Cage), Ronny Munroe (TSO, Metal Church). Check out the rest at the EoE website. Expect some strong performances by all, even if they sometimes seem engulfed, up to their eyeballs, in the music. Here are a few highlights: Hammer Down seems made specifically for Udo, as it sounds like an U.D.O. However, the all-star version with several participants is even better. 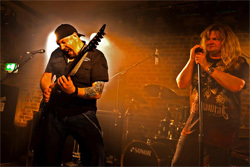 Born A King with Danny Cecati (Eyefear, Pegazus) brings a more traditional metal sound. But you can pass on the Sean Peck version. As with the title track, Peck is generally off the rails. Lion for Lambs with Alessandro Del Vecchio (Edge of Forever) finds this metal vocalist in a heavier frame. Otherwise, expect tight arrangements, excellent production and, of course, Stu Marshall's ripping metal guitar solos. If he was after a heavier, more metal, work, then Channelling the Infinite accomplishes his goal. Recommended. With Channelling the Infinite, this time, Stu Marshall's Empires of Eden project goes straight for classic and melodic power metal with, of course, the usual cadre of great metal vocalists.